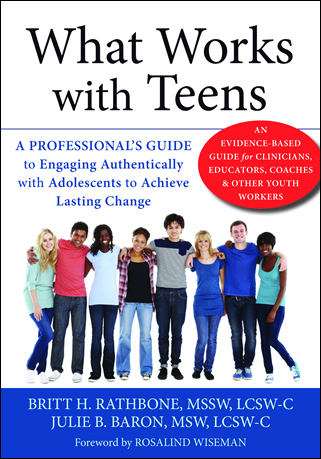 Two clinical social workers offer clinicians, educators, coaches, and other youth workers the first professional book that focuses on engaging authentically with teens in order to create lasting change. Anyone who works with teens should read this book. If you work with teens, you know they are notoriously challenging to communicate with. And when teens are resistant to help, they may respond by acting defiant, guarded, defensive, rude, or even outright hostile. In turn, you may respond by reasserting your authority—resulting in an endless power struggle. So how can you break the cycle and start connecting? In What Works with Teens, you’ll discover the core skills that research shows underlie all effective work with teens. You’ll learn how to engage authentically with teens, create an atmosphere of mutual respect, and use humor to establish a deeper connection. Many books offer evidence-based approaches for working with teens, but very little information on how to establish and maintain a productive working relationship. This is the first trans-therapeutic book to provide real tools for creating a positive relationship with teens to help bolster effective treatment. Whether you are an educator, coach, medical or mental health professional, no matter the technique or intervention in your method of service delivery, relationship skills are essential. If you are looking for more effective ways to connect with teens and are ready for a program that really works, this book is a vital addition to your professional library.